Situated 445 kilometres from Bangkok, Khon Kaen is the capital of Thailand's northeast plateau. Encompassing an area of almost 11,000 square kilometres, Khon Kaen boasts a plethora of exciting attractions. In fact, there is so much to see and do in Khon Kaen that travelers often have trouble deciding where to start. Take in the region's captivating history at Khon Kaen National Museum, enjoy a picnic at Kaen Nakhon Lake or discover the amazing local flora and fauna of Phu Wiang National Park. Khon Kaen is also the centre of the famous northeastern silk industry with numerous villages producing their own mudmee designs. Every December the city hosts a Silk Fair when all the best materials are on sale at bargain prices. 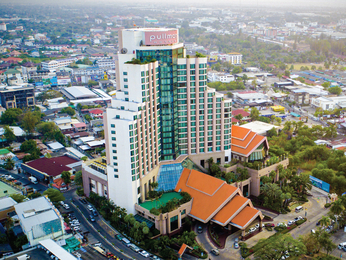 Located deep within this colourful city and near Khon Kaen airport, Pullman Khon Kaen Raja Orchid provides its guests with five-star accommodation and first class service. The hotel offers an entertainment complex, six restaurants, four bars, a pool, day spa and grand balloon catering for 2000 guests.